Trying to make a fresh start must be difficult when you've been the front man for one of the most popular pop-punk bands of the last 10 years. This just the task that Kenny Vasoli has in front of him with his new band Person L. Nevertheless they shouldn't be thought as Kenny from The Starting Line's new band, as 'The Positives' is completely different to that band, as Person L have crafted an wonderful, sensible album, as it expands on the more mature, deeper sound of the bands debut 'Initial'. 'Hole In The Fence' acts more as instrumental introduction with a hint of experimentation, as the slow acoustic build up leads to a full-on performance with guitars soaring and dominating and cymbals crashing. This leaves you with a grand impression. However this impression is quickly forgotten as 'Good Days' brings us back down to earth with its steady rock tempo, something which enables the listener to settle into the album. The title track 'The Positives' also manages to do this, as its simple yet affective structure and lyrics compliments the albums flow-ness. Despite this laid back approach, there are a number of tracks that bring the album alive. 'Goodness Gracious' has a garage rock 'n' roll vibe with its fuzzy guitars and Vasoli's forceful vocals. 'New Sensation' and 'Loudmouth' follows the same idea with its upbeat and feel good temp. Throughout signs of Vasoli's maturing shine through, both lyrically and musically. 'Stay Calm' is slow and dreamy with slight psychedelic twist. While 'Changed Man' stops and starts with its intense build up as Vasoli's distorted vocals scream in and out and the bands guitars experiment with twisting chords. As a whole 'The Positives' proves to be an enjoyable record, as its blend of soft and loud songs are structured well and is effective. Add to this a bit of variation, as Person L subtly cover genres such as indie rock and garage rock with hints of experimentation, and you are left with a record that shows is interesting and mature. This is something Kenny wanted to succeed in, as his able to show he can write songs that aren't standard pop-punk themes. Instead he shows he is able to branch out and show he can move on from former glory's; although The Starting Line are said to be reforming in the near future. The downfall of 'The Positives' is that some tracks on their own do not have the same affect, as when they do when they are played as part of the whole album. 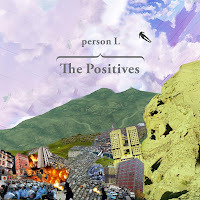 'The Positives' by Person L is released digitally in the UK on November 16th on Scylla Records (physical release in December). The US release is on November 17th on Academy Fight Song and Human Interest Records.